Thanks PAN. They look great together, love Amal's dress. Wonder what the might be up to in Rome? Loads of friends there I think. Walter Veltroni was mayor a while ago, and oversaw the recreation of the Shakespeare's Globe theatre there. Weekend away. As far as we know they were in London last week. The Daily Mail catching up...........let's see how fast they update this story! They are Hollywood's power couple, and they recently ruled Cannes. 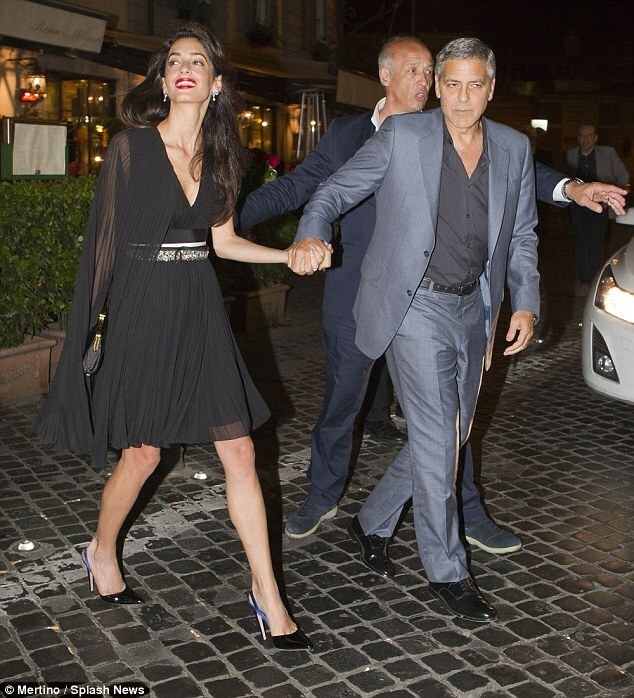 And Amal Clooney and her silver-haired husband George, 55, decided it was time to slow things down a notch as they headed for date night at Dal Bolognese in Rome on Saturday night. 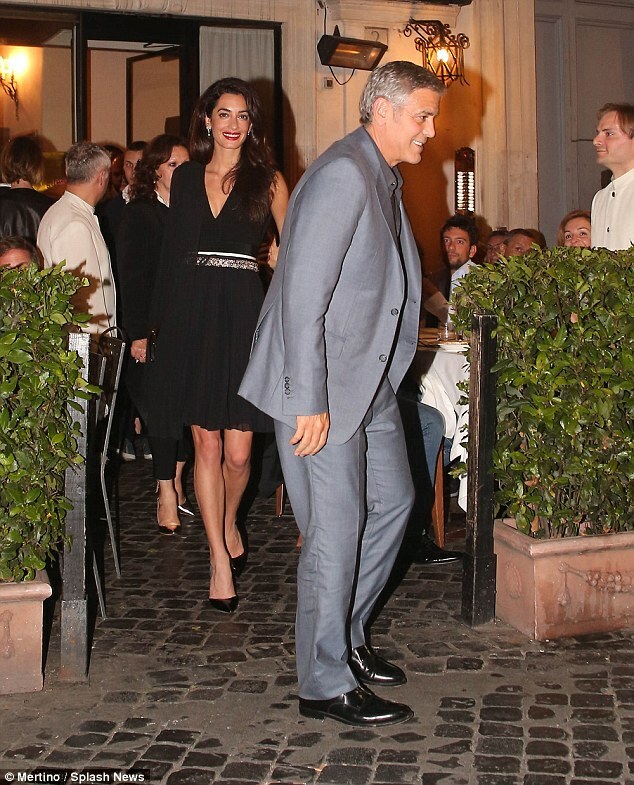 As well as Amal looking truly stunning, it was all about the romance for the pair, as they put on a super sweet and very tactile display as they headed back to their hotel later in the evening, the actor with his arm around her waist. Showing that their marriage of a year and a half is going rather well, the pair appeared like smitten teenagers as they headed back to their room for the night. The 38-year-old human rights lawyer looked absolutely delectable in a plunging black gown, which accentuated her modest cleavage and flaunted her endless legs. Cinched in at the waist with a printed belt, the gorgeous little number flared out before stopping just above her knees. She further accentuated her lithe figure in a stunning pair of pointed black heels which boasted royal blue slingbacks. The night of dining and wining seemed to have gone off well, as the beauty emerged from the chic restaurant sporting a hug smile on her deep glossy pink lips. Her lush brunette tresses cemented her effortless style, as they cascaded immaculately down her front. Accompanying her was her husband of nearly two years George, who looked dapper in a grey suit. He sported a darker button down shirt underneath, before pulling in the look together with slick black boots. Hollywood heavyweight George recently went all out to to promote his new thriller Money Monster at the annual Cannes Film Festival. Amal however, suffered from a slight fashion malfunction during the premiere night as she couldn't seem to tame the long length of her stunnign yellow gown. The film is directed by Jodie Foster and stars Julia Roberts as well as British Skins actor Jack O'Connell. Money Monster centres around TV host Lee Gates (Clooney) and his producer Patty (Roberts) who are put in an extreme situation when an irate investor (O'Connell) takes over their studio. 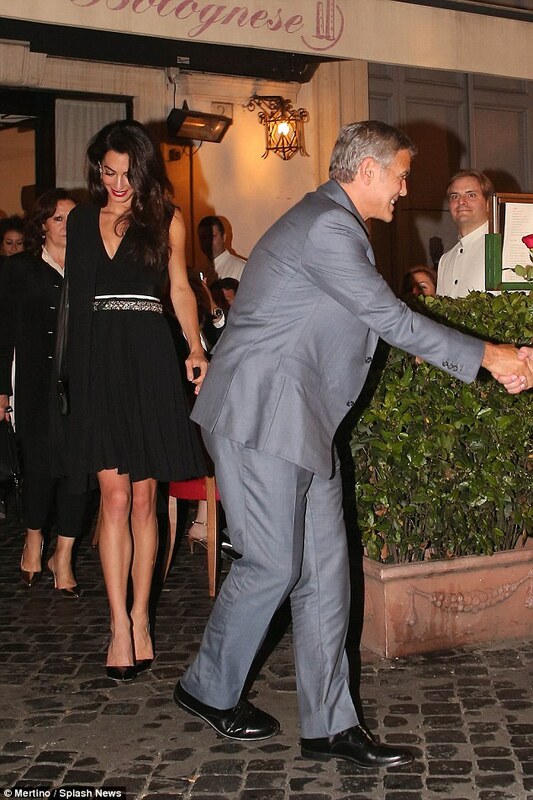 In the last pictures Amal is wearing a hat George is in a suit it looks like they are going to some event. They went to the vatican explanation is under the pictures from Frenchies site. Getty has more pictures Salma Hayek is there also. What a handsome couple, they look both great.